ODG | What Does ODG Mean? ODG means "Oh Dear God". 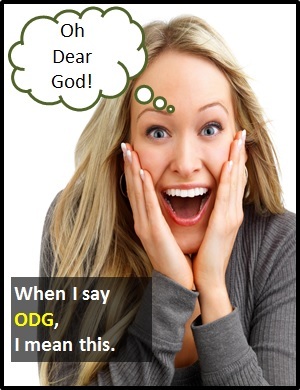 ODG is an exclamation (much like OMG (Oh, my God) and OMD (Oh, my days)) typically used to express astonishment or incredulity. Person A: Look who just walked in. Person B: ODG! She's wearing the same dress as me! Person A: Look out of window now. There are dozens of shooting stars. Of note, ODG is an initialism abbreviation. Technically, this means it is pronounced using its individual letters (i.e., Oh Dee Gee), but as this is harder to say than "Oh dear god," it is not often uttered using its letters. In other words, the abbreviation ODG is for efficiency in writing and not efficiency in speech. Before the digital era, we might have said something like "Oh, my goodness" or "crikey" instead of ODG.